GridinSoft Notepad is designed to provide the power and functionality to satisfy the most demanding text editing requirements. 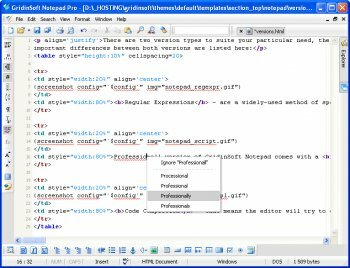 Use of the standard Multiple Document Interface (MDI) allows many files to be edited simultaneously. The spelling checker has dictionaries for 7 languages, and additional dictionaries can be created from word list files. Text can be dragged and dropped between files, and to other applications. GridinSoft Notepad has a customizable tools menu, shortcuts and interface styles (skins). Text can be automatically aligned and indented, relative to the previous line, to aid block indentation. Print previewing, and printing with customizable headers/footers. It also has a built-in calculator that can evaluate math expressions. This is a strange one. As a notepad program, this is the best tool a coder can have. Very carefully planned and visually attractive. But the support and registration is not so great at all! Purchased this (Pro version) in 2008, and they (Gridinsoft.com) didn't send a registration code at all, instead i got after 2 requests after 3-4 days by email a login/password to the registrated users' area on their server. There was a link for the program to download. Sometimes back in 2010 i wrote them because i wanted to download my last updated program version i had paid for and they never replied to my emails. And there was no the program to download any more in the registrated users' area. About a week ago i had to re-install the program to my new computer and used the original Pro version installer from October 2008... Guess what. No chance to enter registration code! It stayed as Trial version, no nag screen whatsoever or anything to enter my registration license code. Just got an idea, and player round with my computer clock, and went back in time to October 2008 and started the program - A nag screen appeared which allowed me to enter the registration code! (?). And finally, the program is now registered. It seemed to me as if they wanted me to buy again their program (Same program version, no updates since 2008 (v3.3.2.7) which i already had purchased and pay them 50 bucks... No way! As a quite nice notepad program, but such a fishy licensing and support, i'll give only 3 stars to this one.